Probhu Tomar paney, Tomar paney, Tomar paney. O Lord, may they all ascend towards You. Probhu Tomar kaney, Tomar kaney, Tomar kaney. Reach Your divine audience, O Lord. Shara jeno dey shey Tobo dakey. May it respond to Your divine call in every instant. Probhu Tomar taney, Tomar taney, Tomar taney. Probhu Tomar daney, Tomar daney, Tomar daney. Silently may it become all empty. Secretly may the heart within become all full. Probhu Tomar ganey, Tomar ganey, Tomar ganey. With Your divine symphony O Lord. 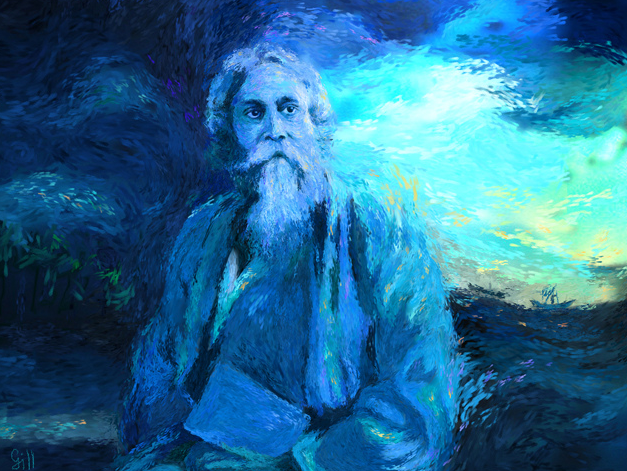 Kabi Guru Rabindranath Tagore, one of the finest modern mystic and poet in the world, Jai Guru! You may download this song as mp3 from here (for personal use only).